Clear skies and plenty of fast-paced action was the order of the opening weekend of Victorian Premier Cricket action. The closest match of the day saw St Kilda hang on by just 3 runs at Harry Trott Oval against Prahran for the RJ Parish Cup. Josh Bartlett (75) and ex-Melbourne keeper Patrick Rowe (52) recovered the total to 9/196 before Jonathan Merlo (3/34) held his nerve in the final overs to deliver victory for the Saints. Sam Grimwade (3/45) was the best with the ball for the True Blues, while Adam Bull (56), Shaun Miller (46) and Nathan King (43) were the best with the willow in the chase. Another close match saw Dandenong open their title defence with a 10-run victory over Ringwood at Russell Lucas Oval. For the victors, Lincoln Edwards (68*) and Akshat Buch (5/32) were the key performers, while new Ringwood skipper Ian Holland (66 & 2/42) tried his hardest to get the Rams over the line. At Mervyn G Hughes Oval, Footscray were unable to chase Carlton’s target of 273 for victory despite the efforts with the bat of Dean Russ (91) and skipper Dylan Kight (44) and Lucas Dredge (3/56) with the ball. For the victorious Blues, Harrison Smyth led the way with 105*, with support from Brayden Stepien (57) and a match-winning spell from spinner Eddy O’Sullivan (5/53). At Geelong Cricket Ground, Geelong held on with a 36-run victory over Melbourne on a ground that was conducive to high scoring. For the Cats, Josh McDonald (92) led the charge with support from the returning Hayden Butterworth (46) and Eamonn Vines (44), while youngsters Angus Boyd (25 & 3/29) and Brody Couch (4/32) stopped the Demons’ charge in the final overs. For the Demons, Sam Harper (114) led the way with Blake Thomson (67), while Sean Sturrock (3/43) was the best with ball. Fitzroy Doncaster left Windy Hill with the points in the bag after a 42-run victory over Essendon. Debutant Sam Elliott (son of ex-Australian and Victorian rep Matthew) led the charge with 58* at number 9 with support from Liam Banthorpe (53*) and skipper Ejaaz Alavi (4/11), while the Bombers had starts from James Seymour and Aaron Ayre (both 42) and Matt Doric (4/33) caused some headaches with the ball. 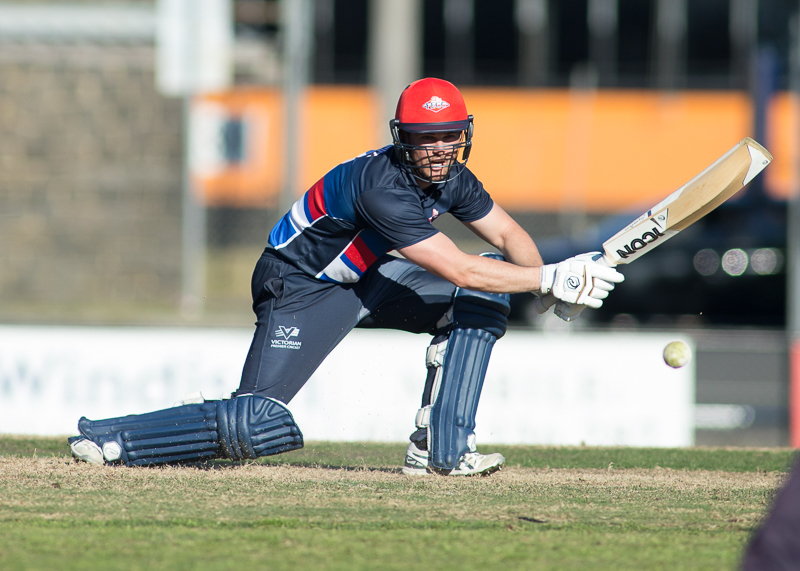 Casey-South Melbourne claimed a 4-wicket win over neighbours Frankston Peninsula at home, despite the efforts of returning UK import Tom Wood (96) for the Heat. Lachlan Sperling (69 & 2/33) was the key plank for the Swans in reply, with support from Jordan Wyatt (55), Nathan Lambden (3/36) and Josh Dowling (2/43). This weekend sees One Day action on both Saturday and Sunday for the Men’s 1st & 2nd XIs. Key games on Saturday will be St Kilda vs Geelong at the Junction Oval, Carlton vs Melbourne Uni at Princes Park #1 and Fitzroy Doncaster vs Northcote at Schramms Reserve #1. Sunday’s games to keep an eye on will be Essendon vs Greenvale Kangaroos at Windy Hill, Kingston Hawthorn vs Frankston Peninsula at Walter Galt Reserve and Footscray vs Prahran at Mervyn G Hughes Oval. In Women’s Premier Cricket, Prahran spoiled the celebrations around Ringwood’s promotion into the top flight at Russell Lucas Oval with a 204-run win, with state trio Annabel Sutherland (106 & 4/26 off 8 overs), Emma Inglis (108) and Alana King (27 & 3/8 off 7 overs) all making light work of Ringwood. For the Rams, Tess Flintoff experienced the highs and lows more than any other player by top scoring with 27 after earlier being removed from the bowling crease for bowling two dangerous balls above waist height, while Co-Captain Kylie Walters (2/41) was the best of the Rams’ bowlers. On the flipside, Carlton-Brunswick celebrated their promotion to the top level with a 175-run victory over an inexperienced Dandenong side at Princes Park #1. Import Ellie Mason led the Strikers on their debut by scoring 103, with regular starts provided by the rest of the side before Tahlia Simpson (4/24) and Tahlya Sleep (3/23) leading the side to victory with the ball. 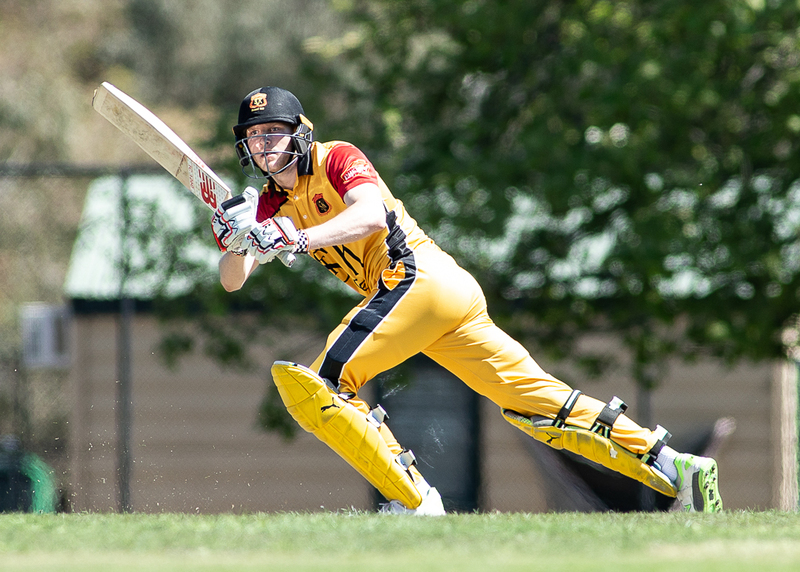 For the Panthers, Lucy Cripps (26) and skipper Emma Gallagher (18) had starts with the bat but did not go on with them, while Courtney Neale (4/33 off 10 overs) led the bowlers, with Jess Matin and ex-EMP recruit Maryam Omar both chipping in with 2 wickets each. At Schramms Reserve, Box Hill squeezed home by 4 wickets over a close-to-full-strength Melbourne side. Demons’ skipper Teagan Parker led her side with an innings of 54, but Elly Donald (22) and Breannon Sutton (19*) aside, struggled to find regular support through the middle order, while Anna O’Donnell (2/31) was the pick of the bowlers that struggled to get the early breakthroughs. For the victorious Mustangs, skipper Rebecca Carter (77*) led her side from start to finish in the chase, with Amy Jennings (25, 1 catch & 2 stumpings), Zoe Griffiths (3/29 off 10 overs + 2 catches) and UK import Jo-Anne Gardner (24 + 2/37 off 7) securing the first points of the season. In the last match at Yarrambat, Plenty Valley could have secured the ‘upset of the season’ title already by pinching a 7-run victory over a star studded EMP line-up. 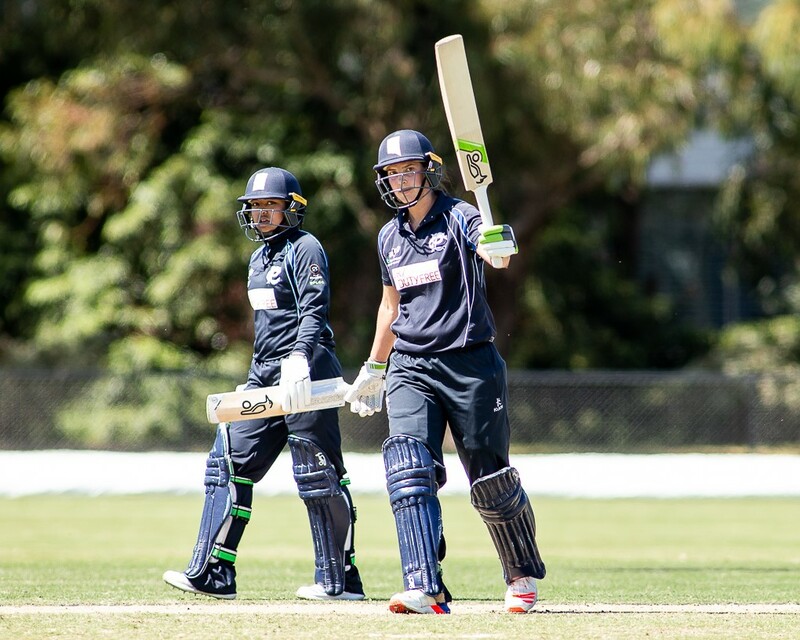 The Bats scratched a total of 127 together with Sophie Day (47) and Sophie Reid (22) the best with the bat, before Australian squad member Tayla Vlaeminck (4/23 off 6 overs) and Victorian squad member Rhiann O’Donnell (5/14 off 5.2 overs) tore the heart out of the Bombers’ line-up. Vlaeminck, who just missed out on a gig in last Friday Night’s Third T20 vs New Zealand took out her frustrations on the EMP side, with her victims being Elyse Villani, Molly Strano, Jenny Taffs and Georgia Wareham (3 out of 4 being Australian representatives)! For the Bombers, Chloe Rafferty (26 & 3/23 off 10 overs) was their best player, while Molly Strano (13 and 4/16 off 9.4 overs) also did her best to contribute. This week’s action will see the battle of the ‘newcomers’ take place with Carlton-Brunswick looking to make it 2 from 2 when they host Ringwood at Princes Park #2. Dandenong host the rampaging Prahran side at Shepley Oval with the fingers crossed that they can get some key members back. EMP will host Melbourne at Aberfeldie Park and will be keen to heal their wounds after last week’s upset loss on the road, while Plenty Valley host neighbours Box Hill at Yarrambat and will be keen to show they will be no pushovers. Michael Beer (St Kilda) will play his 150th Premier 1st XI match this Saturday when the Saints play the Cats. Beer has taken on the captaincy full-time with the Saints this season and has been a stalwart of the side since his debut in 2003/04. Beer in his 1st XI career has scored 808 runs (H.S. 53) and taken 293 wickets (Best Bowling 6/27). Beer has also had a stint in WA, represented Australia in Test Cricket and is again contracted with the Melbourne Stars for BBL|08. Dylan Kight (Footscray) will play his 150th Premier 1st XI match this Sunday (if available) against Prahran. Kight in his 1st XI career has made 3,978 runs (H.S. 146* - one of 6 centuries) and taken 197 catches and 39 stumpings (at time of writing) since his debut in the 2009/10 season. Steven Reid (Melbourne Uni) will play his 150th Premier 1st XI match this Sunday (if available) against Melbourne. Reid has made 975 runs (H.S. 64) and taken 224 wickets (Best Bowling 6/52) in his 1st XI career since his debut with Essendon in 2007/08. Reid has been a part of the Melbourne Uni line-up since the 2013/14 season. Josh McDonald (Geelong) will play his 100th Premier 1st XI match this Saturday against Geelong. Originally debuting in 2010/11 with Richmond, McDonald has made his home in Geelong since the 2012/13 season. McDonald has scored 1,827 runs (H.S. 105 – only century) and taken 81 catches and 21 stumpings in his 1st XI career. Ryan Ninan (Kingston Hawthorn) will play his 50th Premier 1st XI match this Saturday against Melbourne. Tallan Wright (Footscray) will play his 50th Premier 1st XI match this Saturday against Monash Tigers. Jack Rudd (Fitzroy Doncaster) will play his 50th Premier 1st XI match this Saturday against Northcote. Congratulations to returning player Christopher Dew (Frankston Peninsula) who notched up his 50th Premier 1st XI match last Saturday against Casey-South Melbourne. Hayden Butterworth (Geelong) scored his 4,000th career Premier 1st XI run during innings of 46 against Melbourne. Josh Manning (St Kilda) scored his 2,000th career Premier 1st XI run during innings of 10 against Prahran. Liam Banthorpe (Fitzroy Doncaster) scored his 1,500th career Premier 1st XI run during innings of 53 against Essendon. James McNeil (Melbourne University) scored his 1,500th career Premier 1st XI run during innings of 65 against Greenvale Kangaroos. Tom Treble (Geelong) scored his 1,000th career Premier 1st XI run during innings of 12 against Melbourne. Liam Bowe (Essendon) took his 50th career Premier 1st XI wicket when he dismissed Fitzroy Doncaster’s Nat Vardi.